The Sabertooth Norns are a Norn Breed created by Ghosthande for the CCSF 2009. 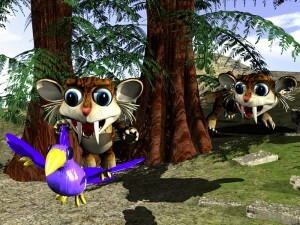 They were inspired by the sabertooth cat, Smilodon, and come with their own prehistoric metaroom named KT. Sabertooth Norns are mainly carnivorous, and they much prefer to hunt critters than eat fruit. Being a primitive breed, they may require some training to successfully integrate into a modern environment such as the Norn Meso. However, despite having a higher resilience to injury they are more sensitive to reward and punishment, making it possible to train them more quickly than other breeds--although they can also hold a grudge against the Hand if treated harshly. The breed takes up Norn Slot X. This page was last modified on 29 October 2016, at 15:39.